Can you imagine Italian cuisine without tomatoes? The Irish without potatoes? Chinese cuisine without spicy, fruity chiles? Such was the case prior to the discovery of the New World nightshades (family Solanaceae) by sixteenth-century Spanish explorers. And they couldn’t help but run into them. Solanaceae is a huge family, with over 100 genera and nearly 2500 species, most of which are in Central and South America. Around 1700 of those species are in the genus Solanum, one of the ten largest (most speciose) genera in the world. The Solanum species potatoes and tomatoes were already American staples when the conquistadores arrived, and they are now first and fourth on the USDA’s list of most-consumed vegetables in the United States. 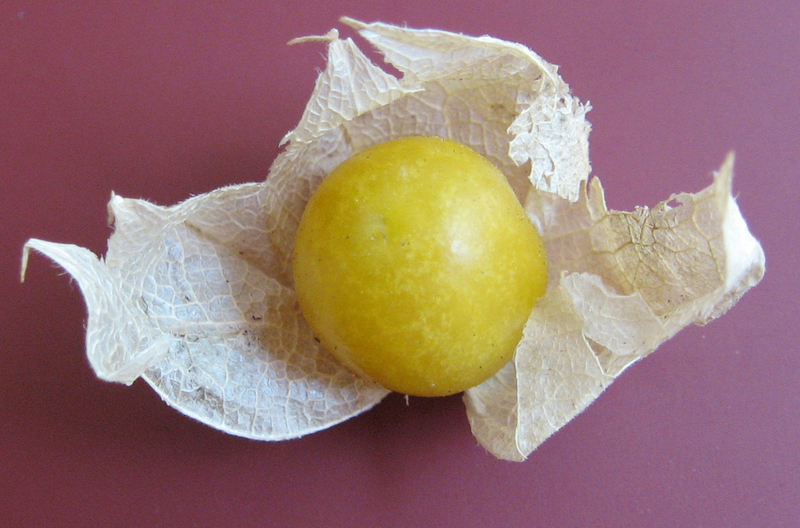 Ground cherries and tomatillos (Physalis) have impressive calyces! Ships coming back from the Americas carried lots of nightshades: tobaccos (Nicotiana spp. ); tomatoes (Solanum lycopersicum); potatoes (S. tuberosum); and chiles and “peppers” (Capsicum spp.). They might have also borne ground cherries (Physalis peruviana), tomatillos (P. philadelphica), flowers (Petunia, Datura), and other fruity Solanum species cultivated at small scales in Central and South America (see phylogeny below). We often hear that all these beautiful and carefully domesticated plant foods were initially rejected by Europeans because their own local nightshades were intensely toxic, or at least psychotropic. While there are very nasty European nightshades (see below), they can’t be blamed entirely for the lukewarm reception. 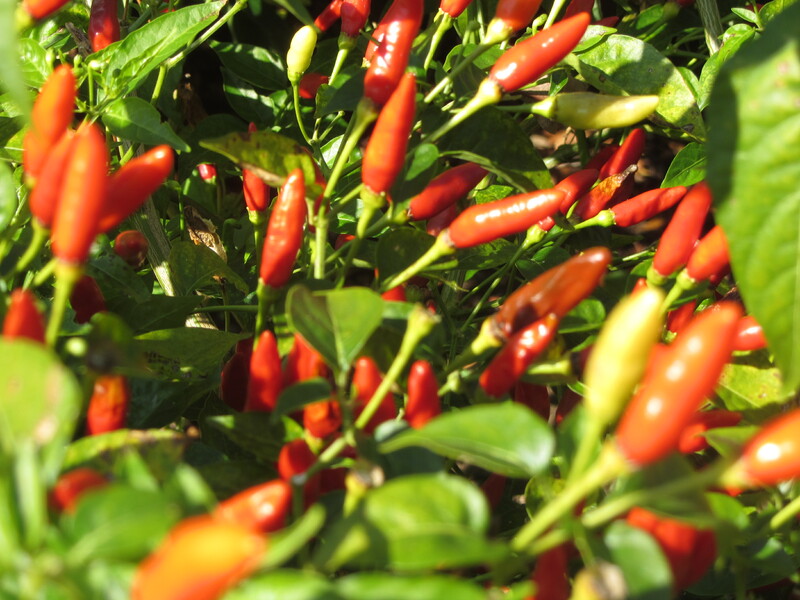 Despite being obvious nightshades, spicy chile “peppers” were instantly popular with a western Europe that had sent Columbus out in the first place to look for black pepper (Piper nigrum) (they’re both “hot”— right?). Eggplants, another obvious nightshade, were already well integrated into Italian cuisine by the time the Spanish ships returned home. 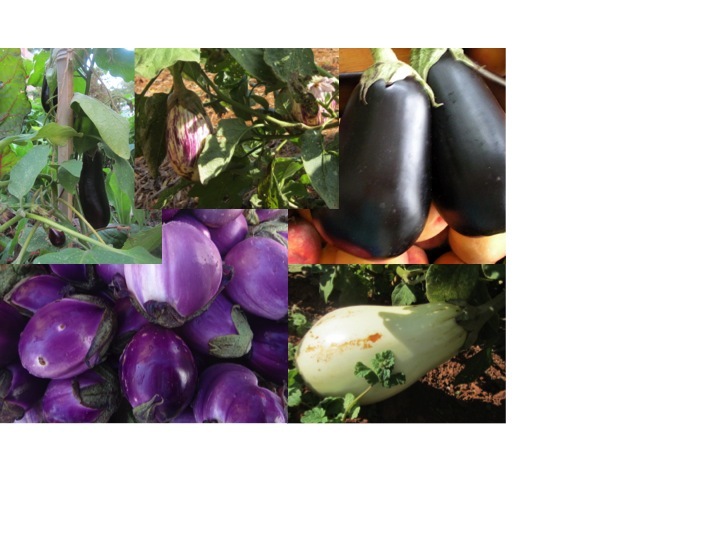 Eggplants (otherwise known by the much nicer name aubergines) are Solanum species that were domesticated independently in both India and China long ago. At least some of the resistance to New World solanums seems to have come from religious leaders, who initially objected to them because they are not in the Bible (Madison 2013, Rupp 2011, Wong), whereas the genuinely dangerous middle-eastern nightshade known as mandrake (Mandragora) gets its stamp of approval in Genesis. The scary-toxin story does raise the question, however, of how Europeans could have known nightshades before the 15th century. Long before European ships began transporting charismatic Solanaceae species home from the Americas, a few American nightshades made the transoceanic voyage on their own, probably assisted by birds. Something like 15 to 17 successful dispersal events are necessary to account for the present-day distribution of Solanaceae native to Pacific Islands, Africa, Australia, and Eurasia (Olmstead 2013). Some modern descendants of three of these dispersal events are shown on the phylogeny in red: Chinese goji berries (Lycium barbarum and L. chinense); European deadly nightshade (Atropa belladonna); and, of course, the eggplants. Evolutionary relationships among some domesticated nightshades. Phylogeny data from Knapp (2002). 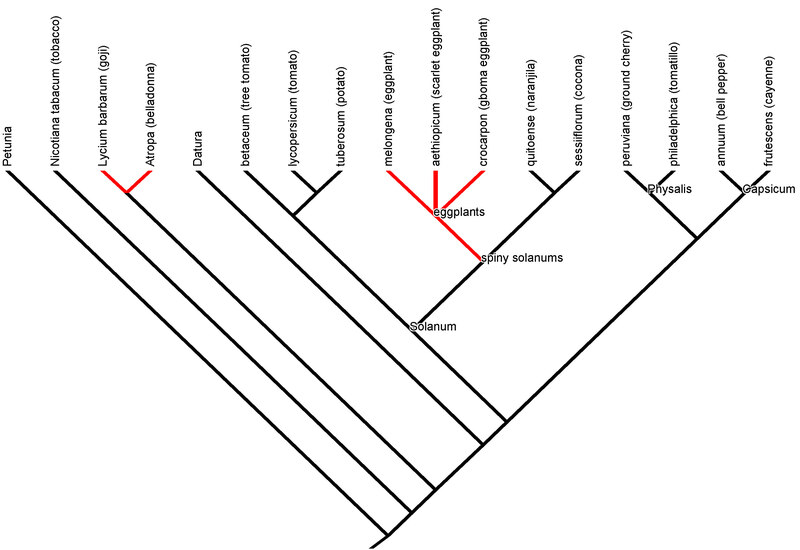 Click to enlarge (to review reading phylogenies, please see our Phylogenetic Food Plant Tree of Life). After being unceremoniously deposited by the birds in their new homeland, the Solanaceae species that successfully gained a foothold in Eurasia and Africa were undoubtedly aided by their potent blends of alkaloids and other defense compounds. People are among the herbivores these toxins repel, and with precious few exceptions, the Old World nightshades earn their reputation as a very dangerous group. Amy Stewart’s excellent Wicked Plants, a compendium of toxic plants and their sins against humanity, is full of great quotes from literary giants—Shakespeare, Hawthorne, Donne—whose devils, witches and medicine men wielded alkaloid-stuffed European (and some American) Solanaceae species: henbane (Hyoscyamus niger), mandrake (Mandragora officinarum), and deadly nightshade (Atropa belladonna). Atropa’s main alkaloid, atropine, dilates pupils. In Columbus’s day, society women in search of a wide-eyed look employed small amounts the stuff before it was adopted by the medical community. Hence the species name belladonna, meaning “beautiful woman.” Famous every-day alkaloids from the New World include nicotine from the tobaccos (Nicotiana spp. ); the fiery capsaicin in chiles (Capsicum spp. ); and solanine, which ramps up when potatoes turn green and is why you should never eat them when they do. In your garden you might find jimson weed (Datura) or angel’s trumpets (Brugmansia spp.) making scopolamine, which has an infamous medical history and is still used in very small doses to treat motion sickness. In fiction, wickedness usually masks a deeper vulnerability, and so it is with the nightshades and their poisons. As with most defense compounds, herbivores and pathogens can eventually overcome alkaloids through evolution. When high genetic variation for defense chemicals exists in a population, like among the thousands of potato varieties in their native Peruvian Andes, each sequential victory by a pest over defenses leads to limited damage, and there is a good chance that cross-breeding can reinstate chemical roadblocks. Relatively few native American varieties made it to Europe, however; and the limited genetic diversity allowed pathogens and herbivores to do more damage there. A fungal-like blight (actually an oomycete) figured out how to circumvent the particular defensive chemical cocktail in the most widespread variety of potatoes adopted by the Irish and wiped out nearly every potato tuber on the island during the Irish Potato Famine of the mid-1800s. Europe’s potato blight woes ended with fungicide sprays, which are still heavily used in European and North American potato crops. Blight-resistant (for now) potato varieties that don’t require sprays (or as much), however, are increasingly available, thanks to many more trips to the Andean potato fields by plant breeders. Blight-resistant potatoes are a huge argument in favor of preserving genetic diversity of agricultural crops and their wild relatives. While we scoff now at European’s initial reluctance to embrace the New World nightshades, we might feel more empathy for the skeptics if we remember that all parts of the cultivated plants – besides the parts we now eat (tomato and pepper fruit, potato tubers) – are potentially very toxic. More than a few rich 16th-century western Europeans became violently ill because their chefs, cooking potatoes for the first time, didn’t realize or believe that the tuber was the only edible structure on the plant. Maybe this explains why we have found a way to eat only a dozen or so species from one of the largest plant families on the planet. Ratatouille is a beautiful showcase for the nightshade family, which is represented by three of its starring ingredients: peppers, eggplants, and tomatoes. This recipe also allows the cutting board botanist to compare and contrast the structures of these vegetables (technically fruits). Like their flowers (see picture), the similarity of the fruits and seeds may overcome any initial surprise you have about the close relatedness of these summertime gems. There are at least as many variations on ratatouille recipes as there are grandmothers in France, and some ratatouille recipes are more elaborate than this one. Julia Child layers her vegetables carefully and other authors roast theirs instead of sautéing them. Feel free to combine the botany below with your favorite fussy recipe if you so desire. Berry: A fruit that is uniformly fleshy throughout (no pits or hard papery bits) and does not naturally split open when ripe. Tomatoes, eggplants, and peppers are berries. Fruit: A mature ovary, normally bearing seeds. Cooks treat the ingredients above as vegetables because they are savory, but if they contain seeds, they are botanical fruits. Only the basil, some of the herbes de Provence, and onion are true vegetables (in this case, leaves). Even the black pepper is a dried fruit. Locule: A compartment within the fruit (ovary). Often, the number of locules corresponds to the number of carpels (leaf-derived subunits) making up the ovary. Placenta: the tissue that connects seeds to the fruit, either at the ovary wall, and thus the fruit wall, or to a central axis. You will sauté the vegetables separately in a skillet or cast-iron pan and then transfer them to a Dutch oven or large stock pot. You should not need a magnifier to see structures described here. 1. Chop the onion and sauté it in olive oil over low enough heat that it becomes soft and sweet without much browning. We will defer a lesson on onion structure for another post. 2. Meanwhile, prepare the peppers. Remove the top of each pepper where the calyx sits. Set one top aside. 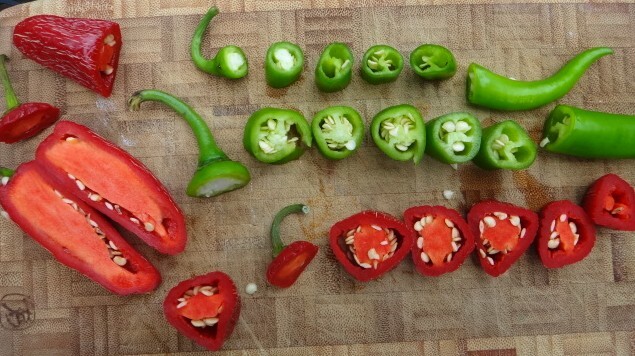 Look down into the hollow pepper and notice that most bell peppers have three or four lobes. Notice also the soft and thin white sheets of tissue running lengthwise down the inside of the fruit. That is the placenta, and it carries some of the seeds. Chili peppers cut to show thin placenta dividing the fruit into two locules. Click to enlarge. In a smaller pepper, such as a jalapeño, the placenta would divide the cavity into two compartments, or locules. This is the ancestral condition. In larger varieties of peppers, there appear to be three or four locules (corresponding to the lobes), and the placenta does not go all the way across the fruit. In these varieties, most of the seeds are attached to the placenta on a mound inside the top of the pepper. Cut the peppers lengthwise, open them up, remove the placenta, and cut the fleshy ovary wall of the pepper into squares about ¾ to 1 inch on a side. When the onions are done, transfer them to the larger pot (not heated yet) and use the newly emptied skillet to sauté the peppers gently. Add additional olive oil if needed. When these are done, transfer them to the cool pot along with the onions. 3. Now address the eggplant or “aubergine,” which is our representative of the Old-World nightshades. Observe its calyx next to the pepper calyx. It is similarly thick and fleshy and not very leaf-like. Often eggplants have five calyx lobes, corresponding to the five sepals that match the five petals on the eggplant flower. Remove the calyx, setting it aside to compare to the tomato calyx. 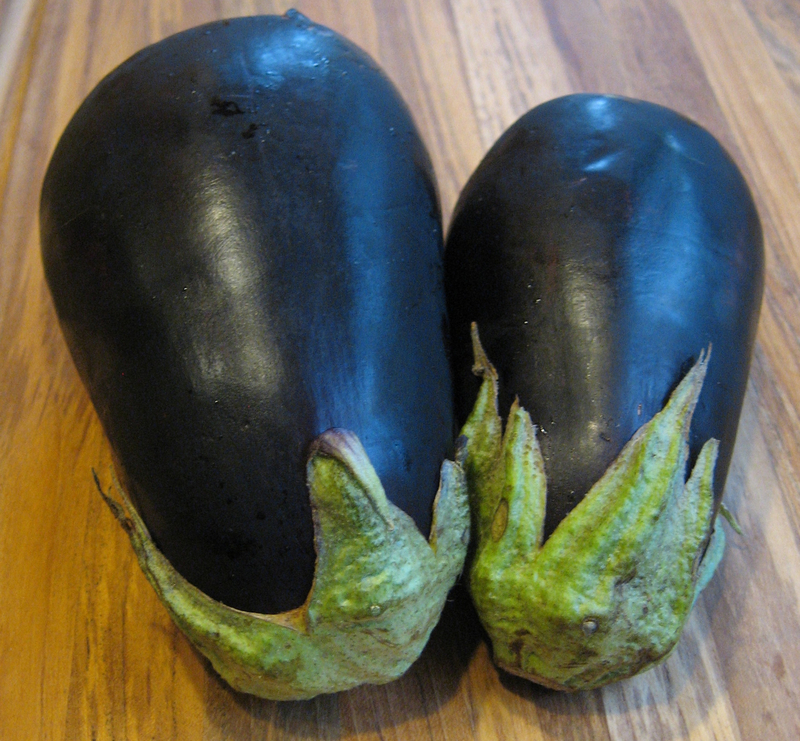 Notice that an eggplant is solid and spongy, whereas a pepper is open. The fruit wall and placenta both contribute to the solid insides of an eggplant. Cut the eggplant crosswise into slices about an inch thick. Cut these slices into cubes. Some recipes recommend salting the eggplant to “remove bitterness.” I have never found the flesh of cooked eggplant to be bitter; and its distinctive flavor is what I like about it. Old skins can sometimes be harsh, so if your eggplants are not fresh, or the skins seem tough, you might peel them. 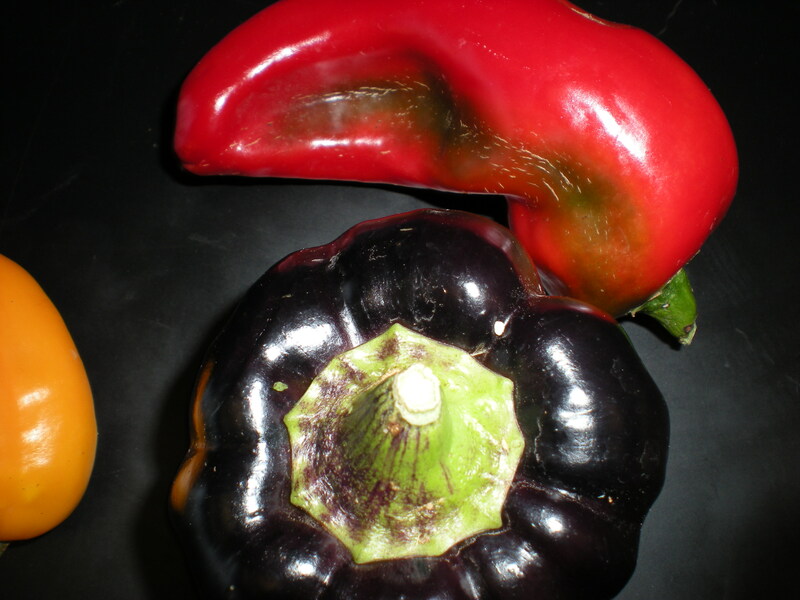 Unfortunately, by removing the black-purple skin you will lose some of the color variation in the finished dish. Seeds in overly-mature fruits can also be a little harsh. If your seeds are very dark when the eggplant is freshly cut, you might avoid using the very center of the fruit. Even young seeds will darken as the fruit sits out. Speaking of seeds, notice how closely they resemble the seeds of peppers and tomatoes. Sauté the eggplant cubes in ample olive oil over slightly higher heat than used for the onions and peppers. The goal is to brown the sides of the cubes but not to let them get very soft. When they are done, add them to the pot along with the onions and peppers, but do not stir them in yet. 4. Chop the zucchini into cubes about the same size as the other vegetables. There are no calyces to notice here since they will have fallen off. Zucchini are in the squash/cucumber family, and we won’t go into details about them here, except to note that zucchini’s ancestors, the American hard “winter” squashes, arrived in Europe on the same ships as tomatoes and chiles. It took a few centuries of plant breeding after that for the Italians to create zucchini. 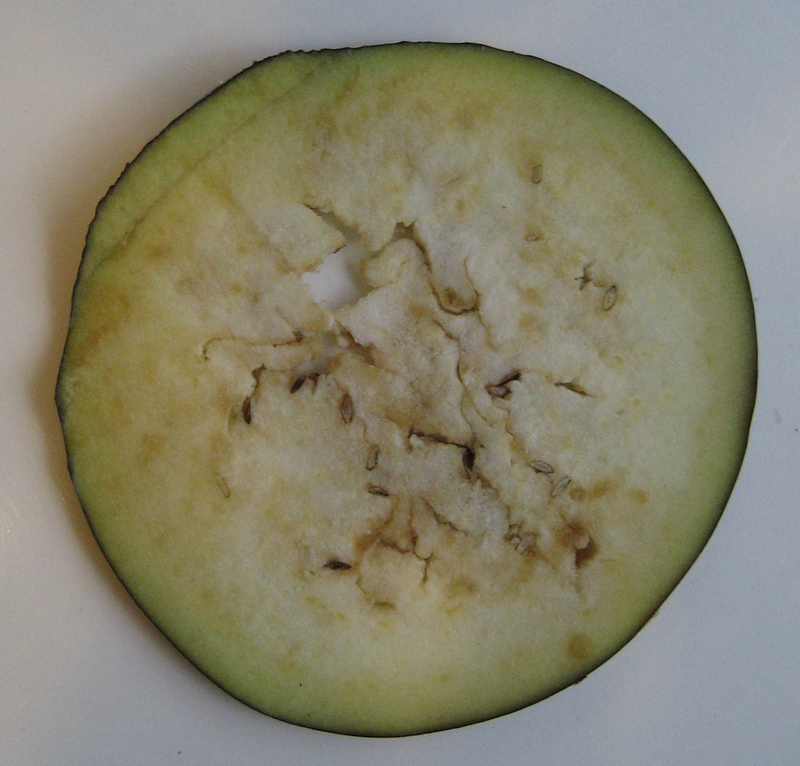 Unlike eggplant, zucchini do sometimes benefit from being salted and drained, not to remove bitterness but to draw out some of the water. I don’t bother here. Sauté the zucchini cubes like the eggplant, to brown the sides but not soften them to mush. If you are using herbes de Provence, add them at the beginning of the sauté with additional oil if needed. Dump the finished zucchini on top of the eggplant in the pot. 5. Prepare the tomatoes. Some tomatoes retain their calyces and others don’t. If you have a tomato with a calyx, compare it to the peppers and eggplants. Note thin leaflike calyces. Click to enlarge. The sepals making up a tomato calyx look much more like leaves than pepper and eggplant calyces do. They are thin and narrow and well separated from each other. Although the ancestral state for Solanum flowers is to have five calyx lobes (sepals), breeding has irregularly proliferated those of large tomatoes. You will probably find a slightly different number on each tomato. 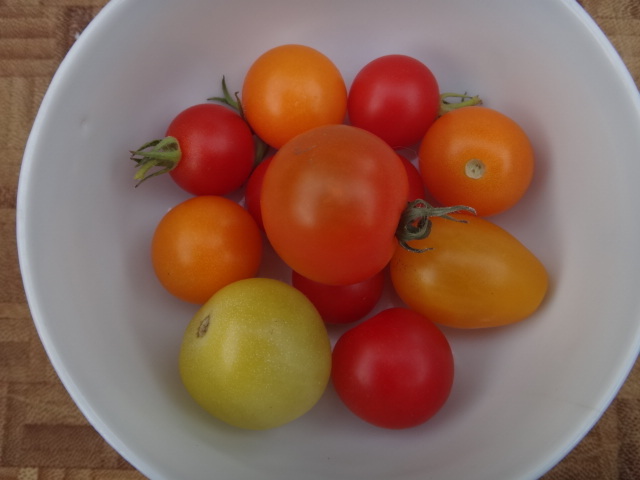 (Cherry tomatoes usually have only five sepals). Remove the “core” of the tomatoes, which is equivalent to the top and inner mound of the peppers. 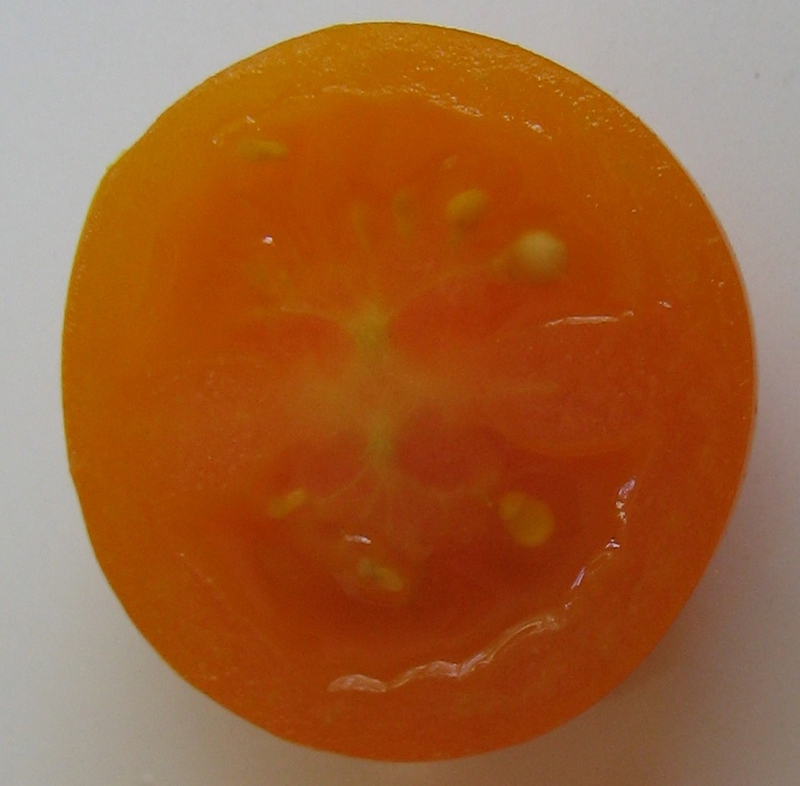 Slice a tomato crosswise and examine its internal structure. 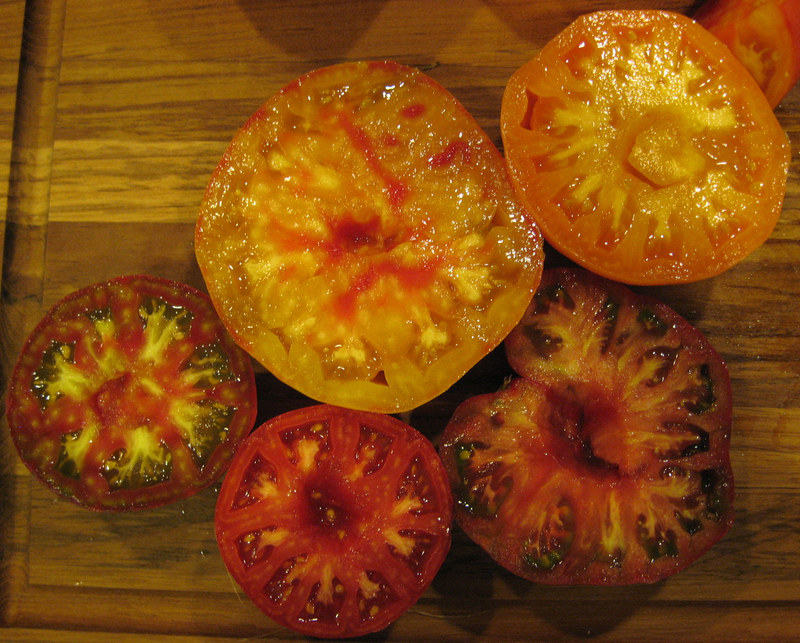 Tomato halves, showing the compartments called locules filled with seeds attached to viscous placenta. Cherry tomatoes still have the ancestral state of two locules separated by placenta. Larger tomatoes have many locules of irregular number and shape. They are neither completely filled with flesh, as the eggplant, nor open and dry, like the pepper. They have solid septa between locules, but the seeds are attached to a gelatinous part of the placenta. Sometimes the outside of a tomato is deeply lobed, cutting in between the locules. Cherry tomatoes have two locules. Click for big. I usually do not bother peeling tomatoes for ratatouille, but peeling does prevent little rolled up bits of tomato skin appearing in the final dish. Chop the tomatoes into large cubes. Turn the heat to medium under the pot containing the other vegetables. When you hear the vegetables sizzle, add the tomato chunks along with any juice they have given up to the cutting board. Gently push the vegetables away from the sides of the pot to let the tomatoes reach the bottom. Once the tomatoes have started to break down and there is ample liquid in the pot, just barely stir the vegetables so that the zucchini and eggplant are submerged. Turn the pot to low and let everything simmer gently. 6. Move the vegetables around occasionally to prevent burning and to speed evaporation. The ratatouille is done when the eggplant is tender throughout and the liquid from the tomatoes has been reduced to your liking. Add salt and black pepper to taste. Ratatouille is usually served as a hot side or main dish, but it adapts well to other uses and can be served room temperature or cold. Below are some alternatives. Filling: Ratatouille is a terrific stuffing for crêpes. You can fill and eat the crêpes right away or make a bunch and bake them in a dish. A bit of sour cream or crème fraîche is good on top. Ratatouille is also good stuffed inside baked vegetables or an omelette. Bruschetta: Appetizers are a great way to use cold ratatouille. Lightly toast slices of baguette or batard and smear them with a bit of soft fresh goat cheese. Top with cold ratatouille that has been drained well with a slotted spoon. Brown bag lunch: Ratatouille is really flavorful at room temperature, so it’s perfect to pack for lunch. Pre-cooked buttery white beans, such as gigante or white northerns, complement both the flavor and the color of the dish. Garbanzo beans also work well, but kidney beans are too soft and strong tasting. Chewy brown rice is another nice addition. Daunay, M-C and Janick, J. 2007. History and iconography of eggplant. Chronica Horticulturae 47:16-22. Knapp, S. 2002. 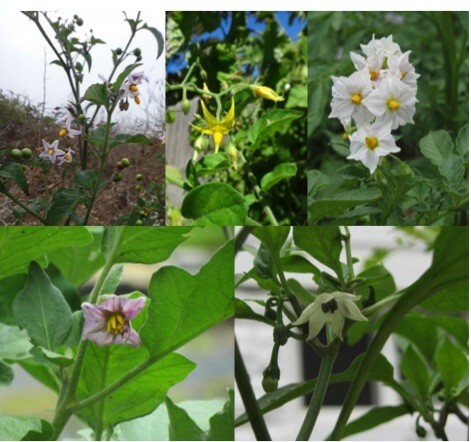 Tobacco to tomatoes: a phylogenetic perspective on fruit diversity in the Solanaceae. Journal of Experimental Botany 53: 2001-2022. Olmstead, R. G. 2013. Phylogeny and biogeography in Solanaceae, Verbenaceae and Bignoniaceae: a comparison of continental and intercontinental diversification patterns. Botanical Journal of the Linnean Society 171: 80-102. Madison, D. 2013. Vegetable Literacy. Ten Speed Press. Poczai, P., and J. Hyvönen. 2011. On the origin of Solanum nigrum: can networks help? Molecular Biology Reports 38: 1171-1185. Rupp, R. 2011. How carrots won the Trojan War: curious (but true) stories of common vegetables. Storey Publishing. Stewart, A. 2009. Wicked Plants: The weed that killed Lincoln’s mother and other botanical atrocities. Algonquin Books of Chapel Hill, Chapel Hill, NC. Van Wyk, B.-E. 2005. Food plants of the world: an illustrated guide. Timber Press. This entry was posted in Fruit, Recipes, Uncategorized, Vegetables and tagged chile, eggplant, fruit structure, goji, ground cherry, Jeanne L. D. Osnas, Katherine Preston, nightshade, pepper, phylogeny, ratatouille, recipe, Solanaceae, tobacco, tomato. Bookmark the permalink. While broiler-roasting roma tomatoes for canning, I had separated out the charred skin, core and seeds, with placental tissue, then placed the roughly cut tomatoes in a colander to drain and saved the rather viscous “water”. All three were put through a food mill to catch the seeds, cooked down, separately, as I am aiming for thick sauce/loose paste. Each has a different taste and texture, but I am most intrigued by the cooked down “water” which is sweeter, brighter in color, and has a gelatinous spreadable texture. My new precious steak sauce? What can you tell me about the botany of this lucky experiment in my kitchen? I feel as if I’ve discovered truffles in my backyard or caviar in my goldfish. What a great observation and question. I’ve never taken the time to cook the parts of the tomato separately and really compare their flavors. I’m no chemist, but I did do a little research into the food-science literature for you. There are measurable differences among parts in acid, sugar, and three important flavor compounds. One research group divides the tomato into three components: pericarp (the firm part), placenta (just the tissue directly connecting seeds to pericarp), and locular tissue (the jelly-like part arising from the placenta). For your question, I think the so-called locular tissue is the one of most interest. This research group reports that the thick locular tissue has higher vitamin C and other acids and (surprisingly) less soluble sugar than the other tissues (Moretti et al. 1998). Most measured aroma compounds are least concentrated in the locular and placental tissues, but there are three exceptions (see Moretti et al. 2002). The aroma compound that is most pronounced in locular tissue is cis-3-hexenol. Two others are similar across all three tissues: beta-ionone and 2-isobutylthiazole. Cis-3-hexenol adds a grassy note, while 2-isobutylthiazole is described as fermented or plastic (Tandon et al.). The most interesting compound is beta-ionone, whose scent is fruity, floral, and perfume-like. It is an important component of raspberry aroma. Even more interesting is that some unlucky people reportedly cannot smell this compound at all (Plotto et al.). So what does this mean for your sauce? I don’t know. The locular tissue has less sugar than the pericarp, but the placenta itself is as sweet as the pericarp. Moreover, cooking transforms sugars, so you could have worked some heat magic on that slimy locular and placenta component. The higher acid might balance some flavors or interact with others. That grassy cis-3-hexenol could be part of it, too. You could have concentrated the complex beta-ionone more in the cooked down placenta than in the chopped pericarp. Or, if by “water” you mean the juice that ran out of the chopped pericarp, well, it must be the higher sugars, which would get thick with the cooking. Do any of those flavor descriptions fit your new sauce experience? Thanks so much for such a thoughtful and quick reply. Your comments and observations are a reminder that curiosity begs for decent documentation, particularly in the absence of a good memory. My ” tomato grappa”, with the thick jammy texture, glossy appearance and tart/sweet taste of that mystery umami-loaded sauce will lead to a more careful experiment for the next round of tomato processing. I suspect it was the juice from chopped pericarp, a liquid many tomato canners strive to minimize. Thanks again for your guidance and references. This is awesome, Katherine. Thanks so much.